EAST COAST NIKE VETS LOOK! The Sandy Hook Unit of Gateway National Recreation Area is located on a barrier peninsula at the entrance to lower New York Harbor. From the Revolutionary War, the site was considered a strategically important location and as a result British loyalists took control of the Sandy Hook Lighthouse. By controlling of the movement of ships, the British controlled New York Harbor for the entire war. 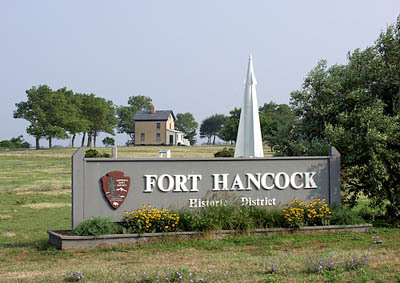 Sandy Hook became home to Fort Hancock in 1895. Fort Hancock was responsible for protecting New York Harbor from enemy attack with large coastal guns. This mission changed after World War II with the beginning of the Cold War when the enemy threat would be coming from the air and not the sea. Fort Hancock became home to NY-56, one of a series of Nike Missile sites that ringed New York City. NY-56 includes a missile launch area (now in use as a park maintenance facility) and a radar site that has been closed and abandoned since 1975 when Fort Hancock was deactivated and turned over to the National Park Service. With the 50th anniversary of the Nike Missile system approaching in 2004, park staff opened the site to guided tours beginning in 2002. At that time, the site was in need of much repair and replacement equipment. The radar platforms and buildings remaining were suffering from many years of neglect. In 2001, the park obtained surplus radar equipment from the Letterkenny Army Depot in Pennsylvania and the Sandy Hook Foundation, the Park’s Friends group, purchased a Nike Ajax Missile on its launcher from a private collector. All of this new equipment as well as the existing buildings and radar platforms needed extensive work. The new items were stripped and painted and the site needed to be transformed. Overgrown vegetation and weathered buildings were two of the larger challenges facing restoration, and were eventually tackled by the Sandy Hook Unit Maintenance Division. 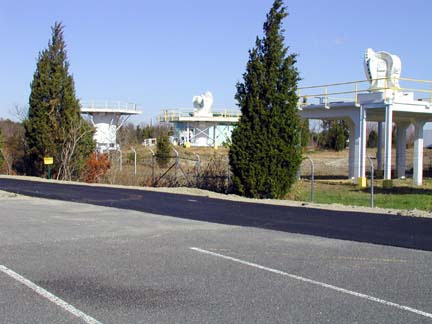 Under the direction of Facility Manager Lou Hansen, the Sandy Hook Maintenance Division began in November 2002 clearing 28 years of growth away from the roadways, the bases of the radar platforms as well as from around four of the radar buildings. Clearing the area was time consuming for a number of reasons. First, the area needed to be cleared without any further damage to the buildings or equipment. Second, the prevalence of Poison Ivy on Sandy Hook required tedious removal of large sections of brush. Third, the goal of the National Park Service is to complete projects while maintaining consideration for the environment and wildlife. Fourth, Maintenance had to clear the area keeping plans for future historic landscaping in mind. Once the brush was cleared the restoration of the individual structures began. Some buildings required new roofing, windows, and structural stabilization, and all required many coats of paint. Maintenance also painted the radar platforms and took on the challenge of mounting the enormous radar antennas. The completion of this phase of the Nike site restoration was key to moving forward with plans to open the site on special event days. These efforts gave momentum to groups like Americorps, who have since completed three smaller scale restorations in support of the Sandy Hook Maintenance Division’s previous work. "It’s amazing to see this site come full circle", says Lou Hansen who worked as a civilian at Fort Hancock before it became a National Park. "At the start we had some real challenges, with all of the vegetation to move, to find replacement radar equipment, and get it all mounted, but we worked together to make it happen." The site now has guided tours once a week, spring through fall, thanks to the tireless efforts of the Sandy Hook Maintenance Division and a group of knowledgeable volunteers. These volunteers include: Don Bender, a Cold War historian and John McKenna, a former Fort Hancock soldier. Don provided detailed information about the equipment so that the restoration of the site and tours are historically accurate. John, who served at the radar site, both gives tours and provides firsthand knowledge to the tour guides. 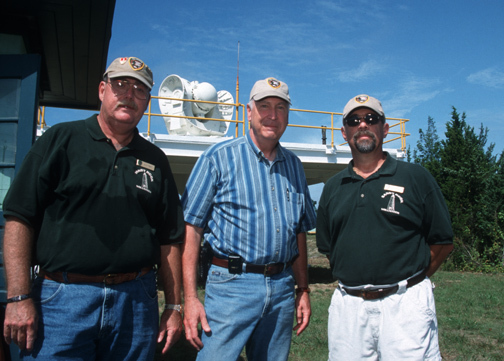 These gentlemen helped train the first group of tour guides. Fort Hancock, NY-56 is now considered the second best preserved site in the country for educating the public on the Nike Missile era, an era that remains unknown for most people due to the restricted nature of the Cold War. Erin Biddinger is a Rutgers University student who completed a ten week internship in the summer of 2003 researching and recording the Nike Missile Era at Fort Hancock. Contact Mary Rasa, the Sandy Hook Museum Curator and supervisor of the intern program for more information at maryrasa@nps.gov or (732) 872-5953. 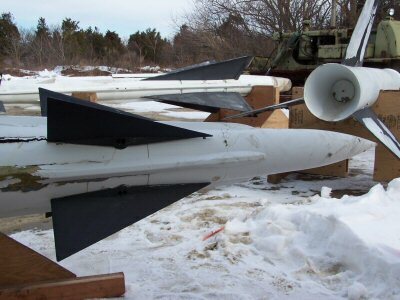 Sandy Hook Foundation President, Betsy Barrett, said that she is “delighted the Foundation is funding transport of the missiles to ultimately augment Sandy Hook’s historical military displays.” Barrett said that additional funding of $7,500 is being sought to transport a third missile, the Nike Hercules, also from Patrick Air Force Base. Parts of 2 Nike Ajax missiles recently arrived at Sandy Hook from Florida. Nike Ajax Missiles were developed by the U.S. Government in the mid 1940’s and became fully operational by the early 1950’s. Designed to engage faster and higher-flying aircraft, the Nike system depended on technological advances in radar and computers made during and after World War II. In 1946 the first test-launch occurred at White Sands Proving Ground, NM and soon after the first missile launch occurred there. The first Nike Ajax Unit was deployed in March, 1954 in Fort Meade, MD, and by May of that year it became fully operational on a 24 hour, combat-ready status. By 1958 almost 200 batteries were built around the majority of the United States’ major northern and coastal cities. But in this same year conversion to the Nike Ajax successor, the Nike Hercules, had begun. Batteries were either modified to accept the new missile, or deactivated. In 1963 the last United States’ Nike Ajax battery was deactivated in the Norfolk, Virginia area, although Nike Ajax missiles continued service abroad for many years. 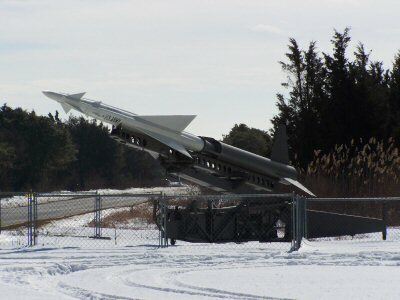 Nike Ajax missile with launcher is displayed at Sandy Hook. 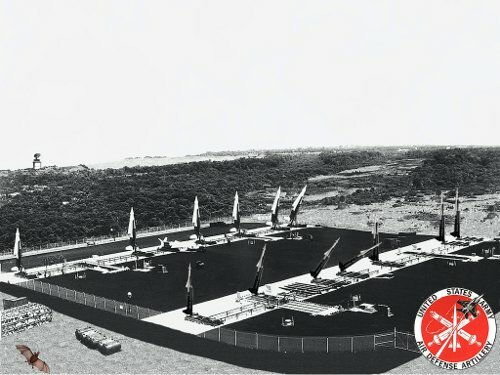 At Sandy Hook during the late 1940’s antiaircraft gun batteries replaced earlier coastal defenses, and eventually Nike missiles replaced the gun batteries. The Fort Hancock missile battery site, Nike Battery NY-56, was activated in 1955. The four-magazine double site continued operation through 1974. Following their arrival from Cape Canaveral, the two Nike Ajax missiles will undergo restoration at Sandy Hook and then be displayed to the public. They will be exhibited at the original launch site located just north of the ranger station near the park maintenance area. Each Nike Missile is 21 feet in length (34’ 10” with booster) with a diameter of 12 inches. The wingspan is 4 ft, 6 in and each weighs over 1,000 pounds (over 2,455 with booster). Nike missiles traveled at a speed of Mach 2.3, or 1,679 mph and reached a distance of 25 to 30 miles. The Sandy Hook Foundation is the Official Friends Group of the National Park and is dedicated to service as a partner with the National Park Service, acting as a catalyst for nurturing and protecting Sandy Hook and historic Fort Hancock for future generations. For more information about the Sandy Hook Foundation please call 732-291-7733 or to contact the National Park Service at Sandy Hook, call the visitor’s center at 732-872-5970.